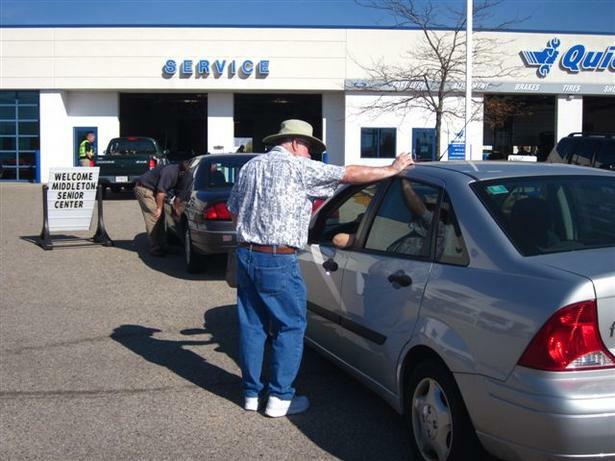 The Middleton Police Department has once again teamed up with Middleton Ford and the Middleton Senior Center to conduct a car winterization program for senior citizens. This free event will be held at Middleton Ford, 7520 Century Avenue in Middleton, on Saturday, October 13th from 9:00am to 1:00pm. This program is targeted towards adults age 60 and older, but no one will be turned away if they are in need of service. Persons should contact the Middleton Senior Center at 608-831-2373 to make an appointment. Police Officers will check the exterior of the vehicle making sure that the horn, turn signals, headlights, brake lights, tail lights and back-up lights are all working properly. Middleton Ford service technicians will then inspect the vehicle fluid levels, belts, battery, tire pressure, tire wear, wipers and any other problems they may note. The vehicles will not be repaired during the inspection, except that tire pressure and fluid levels will be adjusted as needed. Participants will be given a list of potential problems uncovered during the inspection and the owner can then take their vehicle to a local repair business of their choice. Participants will wait in the Middleton Ford customer lounge where they can help themselves to coffee and refreshments and look over some crime prevention materials. This annual program is sponsored by the Middleton Senior Center, Middleton Ford and the Middleton Police Department.